Quicker strides begin to first turn into slow running and then faster and faster…. bus # 5 is approaching the bus stop right outside the gate of my housing colony. I see it and can feel that I am going to miss catching it by few seconds. The conductor in his clean khaki uniform and nice leather sling pouch is now pulling the string to the bell 2 times, signaling the driver to GO. I feel disappointed with my poor luck and am worried about being late to my class. It’s my first week in the new junior college and it’s important to not miss out on these introductory classes. Anyways all is not lost, I tell myself as I do some quick thinking. There’s a traffic light around a quarter mile ahead that I know takes really long to turn green, chances are that I will be able to catch the waiting bus there. I start to run again. My new woodland shoes are looking good. I am thinking about the pathetic red and blue line buses of Delhi and those uncouth and unclean conductors who are always shamelessly scratching their balls and blatantly forgetting to return your change. Compared to that this is pure heaven. I am able to run on the road without being mocked or bullied, the old conductor in Bus #5 might get little cross with me boarding his bus in between stops but he will quietly take the money from me, would demand to look at my student pass and will hand over my ticket while I settle down in a nice empty window seat. Life is good. But Oh no! 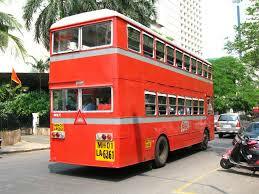 The light has turned green, my bus starts to move again, should I run after it as the road ahead looks pretty jammed? Or wait at the adjacent stop for the next bus?? The bus stop of the coaching center is in a crowded market area. 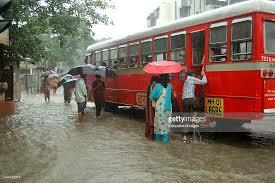 It’s been raining since afternoon so trains and busses are running late due to waterlogged roads and train tracks. There are at least 3 times more people waiting at the bus stop than normal days. It’s 6:30 pm, I have been waiting since last 45 min and there’s no sign of my usual bus #336. Still new to Bombay rains and relaxed about getting wet in the wonderful warm rain once in a while like “Delhi-wallas”, I had yet again forgotten to carry an umbrella with me this morning. But today it’s getting a bit too crazy even for me. I had a friend share her umbrella with me to walk to the bus stop and now I am under the shelter of the bus stop with only my head protected from the heavy downpour and water splashing on me from all sides. Turns out my woodland shoes aren’t really water proof so feet are soaking wet. There’s no way I can go around searching for a pay phone to call my parents, I guess they will anyway know that I will be home late today. Suddenly there’s excitement amongst the waiting commuters. Our bus is just around the corner. People start to get up hurriedly and organize into a single file. I get the glimpse of the awaited bus and am not surprised to see that it’s already packed. I am in the middle of the file and would most likely manage to get pushed inside the bus and find a spot to stand through my entire journey. I am thinking fast.. I have to choose between at least an hour of standing in the bus packed with wet, sweaty passengers or wait for the next bus to come with possibly less people in it.